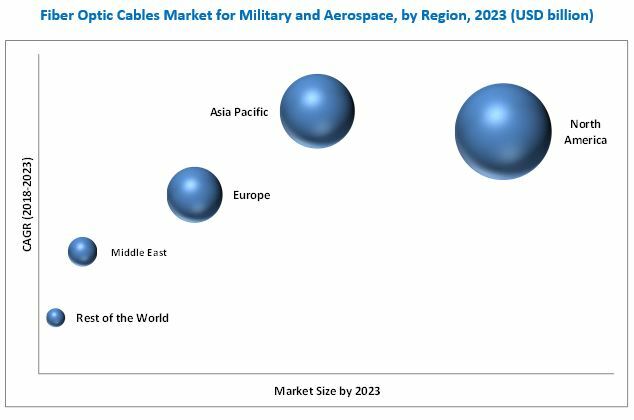 [154 Pages Report] The fiber optic cables market for military and aerospace was valued at USD 1.81 billion in 2017 and is projected to reach USD 2.00 billion by 2023, at a CAGR of 1.93% from 2018 to 2023. The objective of this study is to analyze, define, describe, and forecast the fiber optic cables market for military and aerospace-based on end use, type, application, and region. The report also focuses on providing a detailed competitive landscape of the fiber optic cables market for military and aerospace. 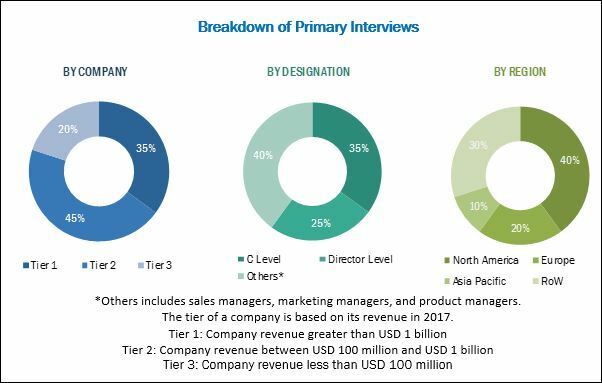 It profiles key market players, highlighting their financial positions, product portfolios, and growth strategies, and analyzes their core competencies and market shares to anticipate the degree of competition prevailing in the market. This report also tracks and analyzes competitive developments, such as partnerships, acquisitions, new product developments, and supply contracts in the fiber optic cables market for military and aerospace. The base year considered for this study is 2017 and the forecast period is from 2018 to 2023. The fiber optic cables market for military and aerospace has been segmented on the basis of end use, type, application, and region. Key companies profiled in the report include Amphenol Corporation (US), Rockwell Collins, Inc. (US), Carlisle Interconnect Technologies (US), Corning Incorporated (US), Finisar Corporation (US), W. L. Gore & Associates, Inc. (US), OFS Fitel, LLC (US), AFL (US), Optical Cable Corporation (US), TE Connectivity (Switzerland), Radiall (France), and Prysmian Group (Italy). Agreements, acquisitions, expansions, and new product launches are the key growth strategies adopted by leading players in the fiber optic cables market for military and aerospace. The fiber optic cables market for military and aerospace is projected to grow from USD 1.82 billion in 2018 to USD 2.00 billion by 2023, at a CAGR of 1.93% during the forecast period. Growth in the fiber optic cables market for military and aerospace can be attributed to the increasing commercial adoption of fiber optics and growth in platforms, such as unmanned systems, space launch vehicles, and satellites. The fiber optic cables market for military and aerospace has been segmented on the basis of end use, application, type, and region. Based on end use, the fiber optic cables market for military and aerospace has been segmented into commercial, military, and space. The military segment is projected to lead the fiber optic cables market for military and aerospace during the forecast period, owing to the increasing use of fiber optic cables for C4ISR applications for high speed communication. Based on type, the fiber optic cables market for military and aerospace has been segmented into single-mode and multi-mode. The single-mode segment is projected to grow at the higher CAGR from 2018 to 2023. Adoption of single-mode fiber optic cables to connect defense units, such as command centers and military weapon stations is expected to lead to the growth of the market during the forecast period. Based on application, the market is segmented into avionics, cabin interiors, flight management systems. In-flight Entertainment (IFE) systems, communication systems, radar systems, electronic warfare, and others. The communication systems segment is estimated to lead the fiber optic cables market for military and aerospace in 2018. This growth can be attributed to the increasing use of fiber optic cables in unmanned systems and military aircraft for high speed data communication. Based on region, the fiber optic cables market for military and aerospace has been segmented into North America, Europe, Asia Pacific, the Middle East, and Rest of the World (RoW). The North American region is estimated to lead the fiber optic cables market for military and aerospace in 2018. The US and Canada are the key countries considered for market analysis in this region. Increasing adoption of fiber optic cables for high speed land connectivity and procurement of military and commercial aircraft are expected to fuel the growth of the fiber optic cables market for military and aerospace in North America. Adherence to stringent regulatory norms and complexities associated with the maintenance and installation of fiber optic cables act as the key challenges to the growth of the fiber optic cables market for military and aerospace. Key companies profiled in the report include Amphenol Corporation (US), Rockwell Collins, Inc. (US), Carlisle Interconnect Technologies (US), Corning Incorporated (US), Finisar Corporation (US), W. L. Gore & Associates, Inc. (US), OFS Fitel, LLC (US), AFL (US), Optical Cable Corporation (US), TE Connectivity (Switzerland), Radiall (France), and Prysmian Group (Italy), among others.